Many Canadians see Bombardier Inc. as a Quebec company that gave us fun outdoor machines such as Ski-Doo snowmobiles, Sea-Doo watercraft and muscular all-terrain vehicles. But a new book by a Mount Allison University professor paints a darker picture of a global corporation that is now a giant in aircraft production and high-speed rail transportation. Thomas, who’s a professor of politics and international relations at Mt. 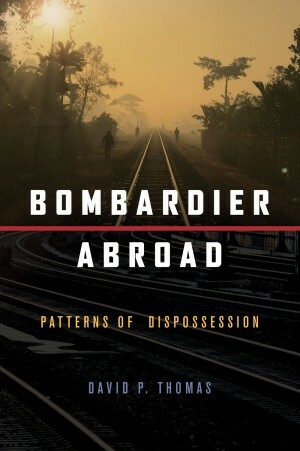 A., deconstructs that “mythology” of corporate benevolence in Bombardier Abroad: Patterns of Dispossession distributed by Fernwood Publishing in Nova Scotia. He defines dispossession as the process of stripping people of land and resources so that others can benefit from them. During the book’s official launch this week at the Owens Art Gallery, Thomas said the inspiration for it came from his longstanding interest in the actions of Canadian corporations overseas as well as the ways in which Canadians themselves are complicit in those actions. Thomas’s book examines Bombardier’s involvement in three controversial high-speed rail projects in South Africa, China/Tibet and Israel/Palestine. He argues these projects have heightened social and political tensions partly by entrenching racial divisions in South Africa that favour the mobility rights of privileged white professionals over those of impoverished black workers and partly by denying Tibetans and Palestinians political independence and control over their own land. Thomas adds that the route through Palestinian territory raises questions about the violation of international laws and UN resolutions that prohibit an occupying power from confiscating land in an occupied territory. “Bombardier didn’t build the rail line,” Thomas says, “but they will be running their trains on that line.” He notes that even though it officially opposes confiscation of Palestinian land, the Canadian government is not questioning the Bombardier project. Thomas rejects the company’s argument that its international business projects have nothing to do with politics. Thomas’s book argues that the railway projects in China/Tibet and Israel/Palestine are examples of what some scholars call “settler colonialism” in which indigenous people are displaced from their land and replaced, in these cases, by Chinese or Jewish settlers. He notes that Canada itself is a settler colony. “Because we live in a settler colonial state and because that is overall normalized in society and in government, then it becomes easier to justify our involvement in similar acts of dispossession and colonialism overseas,” he says. As a settler on this land, my intention is not to deflect attention from, or abdicate responsibility for, contemporary forms of dispossession in Canada by focusing on case studies abroad. On the contrary, my goal is to highlight the fact the Canadian actors are simultaneously complicit in processes of dispossession both at home and abroad and that dispossession abroad is in some ways normalized because of dispossession at home. 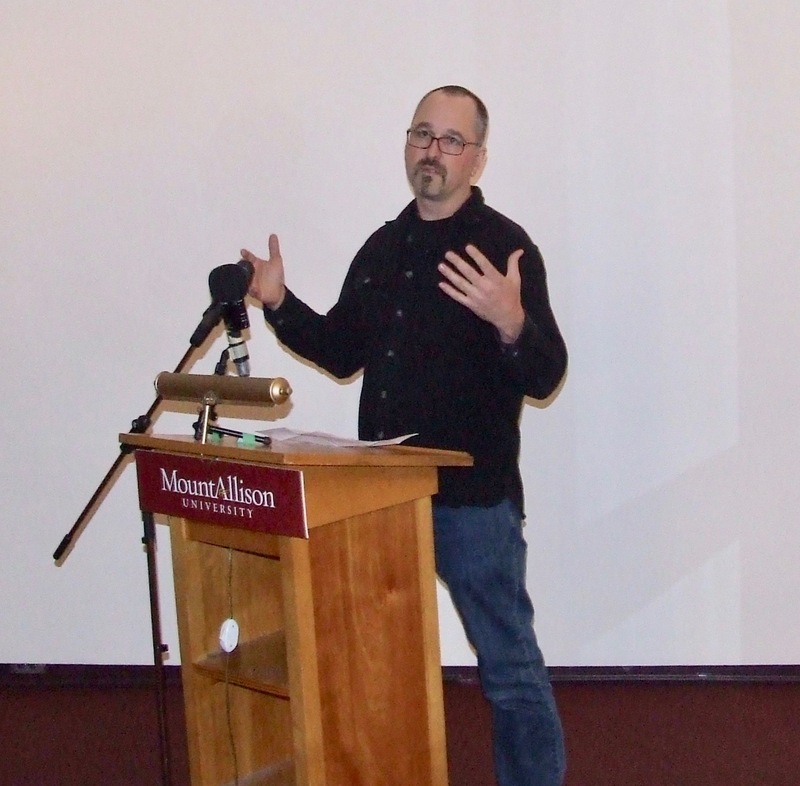 This entry was posted in Indigenous affairs, Mount Allison University, Technology and tagged Bombardier, China/Tibet, David Thomas, dispossession, high-speed rail, Israel/Palestine, South Africa. Bookmark the permalink. Let me start by acknowledging the following: I like Dr. Thomas and I congratulate him on his new baby (his book, I mean 😊). It takes a lot of discipline to write a book. For this, he has my utmost admiration. This being said, I have VERY mixed feelings toward his book for several reasons. No, I should correct myself: I have more negative than positive feelings toward the idea of his book (that I have not read yet). Here is why? I promise to try to be concise. First and foremost, I am Canadian… ok, Lebanese-Canadian. I am Quebecker in my heart, I am New Brunswicker big time, Ontarian, Maritimer for sure, Lebanese as well (from the diaspora) and citizen of the world…. But deep inside, as a Lebanese-born, I am Arab (I did not say *indigenous Arab*, as I read somewhere… not too sure if Dr. Thomas’ own words or someone else). As someone from Québec and as a Canadian, Bombardier is my PRIDE. I feel moved each time I see subway trains in Europe made by Bombardier. Sometimes I joke saying why don’t we have such quality products here at home too. Like Dr. Thomas (and Mr. Maxime Bernier), I think our federal government should not be helping companies like Bombardier with our tax money. However, perhaps contrary to Dr. Thomas (and I am sure like Mr. Trudeau and Mr. Bernier), I salute Bombardier and all our Canadian companies—small and large ones. I have the utmost respect for entrepreneurs! I have many friends who work for Bombardier in Montreal, mind you (many are Lebanese-Canadian or of other Arab origins, mind you… I am sure perhaps even Palestinian or Jordanian-born ones). Assuming we follow Dr. Thomas’ logic about Bombardier abroad (the Evil), where does he want us to go with his thesis? After the fossil fuel divest obsession would end (regardless of its outcome), should we start boycotting Bombardier? What about Siemens too? Should we expand to it too? Plus, isn’t the job of companies to earn money and do a decent technologically safe job? What if Bombardier decides to donate money to our organizations? Would he push to ask us to divest from it for ethical reasons? Second, what does *indigenous* mean really? I come from this wounded Middle East. I happen to have relatives of Palestinian descent (whose ancestors were kicked out of their house in Jerusalem when the tragedy happened) and to be married to a Jewish-Canadian man. The Middle East is in my blood, on our plates (thanks to Louis 😊), and in our passionate home discussions (we do not always agree but we grow through the other’s perspective and learn). More seriously, the suffering of the Palestinian people is my own suffering as a human being (I consider myself a humanist) and as someone whose country of origin was triangularized into civil war, initially because this endless Israeli-Palestinian conflict (that we are all sick and tired of ☹). I have always denounced occupation (in ways I will not describe publicly). I surely see the settlement issue there. However, as a human being too, I can also see the fear, concern, or suffering of Israeli families as well…BOTH Israeli and Palestinian kids deserve peace…and trains. Imagine if the Lebanese people would say Lebanon must be for the Phoenicians as we are all settlers after all the invasions and civilizations over 2000 years (genetically, it seems that up to 80-85% of the genetic make-up of Lebanese people is traced back to the Phoenicians. The latter do not exist anymore… or maybe they exist through me somehow, even if I call myself Lebanese or Arab). It would be too funny. Related to this logic, I have always joked that if I need to boycott the food of all the occupiers of Lebanon, I can literally only eat *poutine* (thank you Canada 😊). Dr. Thomas, contrary to you, I proudly call Canada by its beautiful name (not like your signature, which I respect but do not endorse). Maybe it is easier for me to do so because my great ancestors were not settlers. Who knows? Yes, sadly we had a VERY bad part of history here…. But I thought we have been on the path of deep regrets and reconciliation. Why should we lose ourselves to this guilt and put our beautiful country at risk of internal *dispossession*, to use your own words? Last but not least, congratulations again on your book Dr. Thomas… but don’t you think we are better building trains in this world than building walls or… selling weapons? I must start with the disclaimer that I haven’t read the book, and am basing myself on the description in this article. As such, I may be missing key points. For reasons that will become apparent, I don’t wish to purchase the book. I disagree with the basic premise. Premises, actually. 1) It’s not a company’s job to enforce various causes. Specifically, in this case, Bombardier’s job is to make a safe, quality train, and to sell it in compliance with applicable laws. Other than that, they should be neutral. It’s none of their business, really. Would you like your bank to refuse to deposit cheques because they don’t like the people who sent them to you? 4) I resent Canada being labelled as a “settler colony”. Bad things happened in the past, yes. White people did bad things to natives. Natives did bad things to natives, too. White people did bad things to other white people. Some natives might even have done bad things to white people (gasp!). At this point, there are a lot of natives living in appalling conditions. I’m all for that changing. But it’s not going to change by labelling the rest of us as “settlers”. Sorry, but I have no other land. I have no other home. I’m not a settler. There’s a point when a pidgin-creole language transitions to a full-fledged language. My opinion is that this happens when it becomes widely spoken as a first language. In my the same way, the time comes when “newer arrivals” are no longer settlers, regardless of past history. It’s impossible to turn back the clock to some mythical time when all was perfect. That time never existed. Before “white people” came to Canada, natives were fighting with each other. Just like “white people” were fighting with each other in Europe. It wasn’t fun. 5) To those who’d like to turn back the clock to that mythical time described above, I’ll say this. Do it in Israel/Palestine also. But go all the way, don’t stop at the Ottoman Empire. Take it to its logical conclusion. Turn it back all the way. Turn it back to a time when the West Bank was called Judea (Yehuda), named after the people who lived there, the tribe of Judah (Yehudim), i.e., Jews. Now, in fairness, some of the exact land that we’re talking was also inhabited by some other (Jewish) tribes, such as Benjamin (Binyamin) and Dan. Maybe that distinction should also be made. But, presumably, that isn’t any of our business. We’ll leave it to them to sort out between themselves. The distinction has largely been lost, by this point. Because here’s the thing: there are very few cases of native people, once displaced, returning to their original land in large numbers. The return of Jews to Israel (multiple times) is the most obvious historical example. Acadians, post-deportation, right here in New Brunswick, is the only other one that readily comes to mind. Interestingly, in both cases, the return focussed not exactly on the original population centres (i.e., Jews shifted somewhat South-West from the original biblical-era settlements, and Acadians repopulated mostly in New Brunswick, not Nova Scotia). So if that’s how “you” would like to look at it, you should celebrate the building of the train, as being the renewal of historical links between the territories of the tribes of Israel, brought about by the return of their scattered descendants. Whatever happened or didn’t happen in 1948, you can view as the righting of a historical wrong, as opposed to a new one, as seems to be the fashion in academic circles, these days. Maybe it’s even time to continue the job: perhaps with modern genetic testing, it might be possible to establish which “Arab-Palestinians” in the area are converted descendants of Jews (hint: a LOT of them), which are long-ago historical (and more recent – lots of those, too) Arab “settlers” (who presumably should be made to “go back” to Arabia, or wherever else they’re from). Never mind that they’re indistinguishable from their neighbours and that almost all will be a mix of all of these origins: we need to segment everyone back to where they come from, in some arbitrary way if we can’t find anything better. Heavens forbid any migration should ever occur: not now, and not in the past. Come to think of it, perhaps a better idea is to send Jews back to Egypt. If this seems like a fascist, pointless, and idiotic exercise, I agree. So, by the way, do the VAST majority of Jewish Israelis. Well into the high 90%s. The remaining few percent would be viewed as mental cases by most of the population, and nobody takes them seriously. If, instead, “you” view Arabs (i.e., Palestinians) as the natives of the land, as yourself why you stop there. The minute that you agree that you have to stop “somewhere”, you might be agreeing that I’m not a settler in Canada. And agreeing that if the Israelis stick it out long enough in the West Bank, they won’t be “settlers” there either. You can’t have it both ways. So pick. Or, perhaps I should “deconstruct” what’s really happening here, instead. This isn’t about land. Either in Israel/Palestine, or in Canada. It’s about culture. It’s about Western culture, and about destroying it, with a view to replacing it by a fantasy world that has never and will never exist. Western culture has problems, I’m the first to state it, and we can and should improve it. But it has still worked out better than most of the alternatives, and those that have worked out better have usually done so by incorporating large elements of Western culture. Israel is a prime example of such a case: a country with people of mostly Middle Eastern origin, who have successfully adopted a great deal of Western values. Lebanon is another nearby example. It’s not a coincidence that they’re two of the most livable places in the region. Western culture is really what is being objected to. The culture that brought us trains, planes, motor cars, antibiotics, personal computers, the Internet and cellphones. Those who’d like to go without that, please line up to the left. Then kindly drop your cellphone in the bin – it was made with Israeli technology. And start the long walk home, because we wouldn’t want you to fly on a Bombardier product. @Louis – You have written a 1500 word reply to an 800 word book review of a book you have never read. Yeesh! At least it’s shorter than the book! I’ll reply to myself to add a tiny bit of information. So the train apparently runs UNDER the West Bank, if the report is to be believed. It seems to me that the world in general, and the West Bank in particular, has much more pressing issues than a train that runs through a tunnel UNDER somewhere, regardless of how one may feel about the situation as a whole.